Step 1 Heat a large, deep, nonstick pan or wok over high heat. Add the mustard and fennel seeds, and toast until aromatic, about 1 minute, stirring the pan so the seeds do not burn. Add the oil, and when it is hot, add the ginger, garlic and chile, stirring to combine. Step 2 Stir in the diced pumpkin and sauté until the pumpkin is coated with oil, cover the pan with a lid and reduce the heat to medium. Cook the pumpkin, stirring occasionally, until softened, 12 to 14 minutes. Step 3When the pumpkin is softened, stir in the salt, mango powder and sugar. Continue to cook, stirring occasionally, to marry the flavors. Taste and adjust the flavorings and seasonings as desired. Transfer to a dish and garnish with cilantro before serving. In Recipes-list.com we have selected the most viewed recipes from category - Sides Vegetarian . Enjoy the best recipes specially selected for you! 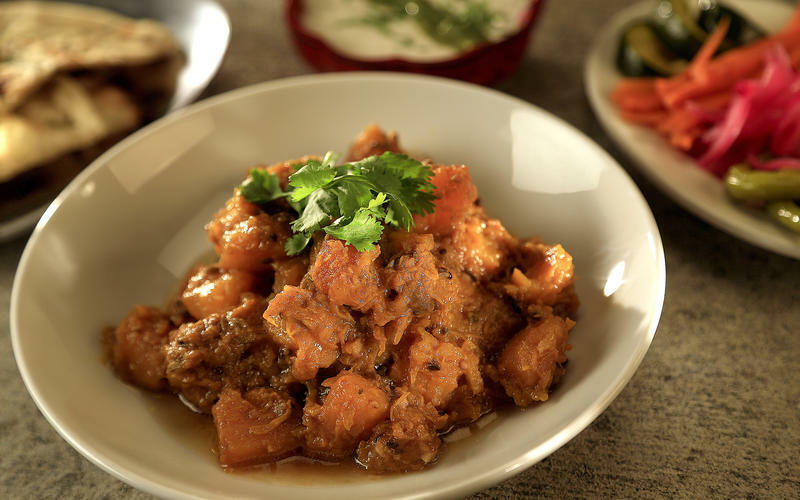 Badmaash’s Punjabi spiced pumpkin is the right choice that will satisfy all your claims.